WAFFLES: Hi everybuddy, Waffles here. It's been really cold here while the Polar Gore Tex has been visiting. I've been hiding out in my super-secret-HEATED-mancave. WAFFLES: Hey Boss. Wanna come in my super-secret-HEATED-mancave? WAFFLES: C'mon, Boss! What's the password? WAFFLES: What's the password, Boss? KATIE: The password is I'm going upstairs to sleep on Glogirly's pillow. WAFFLES: Awww, c'mon Boss! What's the password? WAFFLES: That's IT! That's IT! Marshmallow! That's the password! WAFFLES: Guess I'll just have to roast by myself. 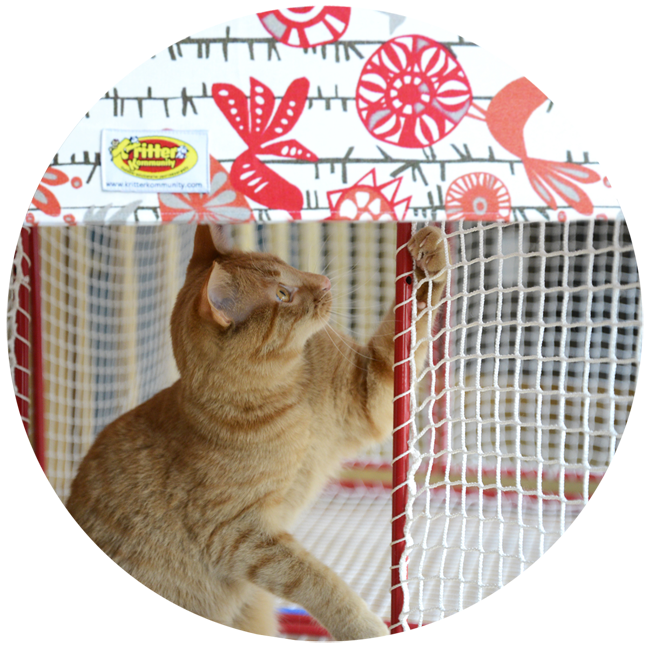 Enter to win a Limited Edition Kritter Kondo Cottage! Awww, I'll come roast marshmallows with you Waffles. Do you think I'll fit in there? aah Waffles! We'll play with you and roast marshmallows too. Nice Mancave! Where do you have room to put all these toys and accessories? I'm sending Ichiro to you to roast marshmallows. Of course, you might need to roast him a little to warm him up first..
Angus will come and play with you. You can have a "ginger man cave night" - he's all boy and loves to play and drive his older "sister" BooBoo Bunnycakes crazy. Hmmm, wonder what would happen if Katie and Bunny had some time together..... Don't worry, our job as cat mama's is to keep the peace. Truffles will come roast with you! Marshmallows? What is that? I need to try those - WOOF! Are those tuna flavored marshamallows? We know it has been super cold where you live! Stay warm and cozy, kittehz (and humans). Pee Ess - marshmallows sounds yummy! That is one great looking man cave. Katie doesn't know what she is missing! He tries Katie's patience so much doesn't he. I hope she is warm enough cuddling on Glogirly's pillow. Did anyone say Marshmallow ??!! Waffles, that's a pretty awesome mancat cave! Dood, we'd be over, but the teleporter is still frozen... don't get the Marshmallow in your furs! A heated Mancave sounds pretty good to us right now too. Jonah will roast & eat marshmallows with you! Vashti & Sam would love the heated mancave even though they're girls! Glad to see you're keeping warm and adorable, sweethearts! We thinks marshmallow is the purrfect word for Waffles. Can I come over and roast some of those marshmallows with you? 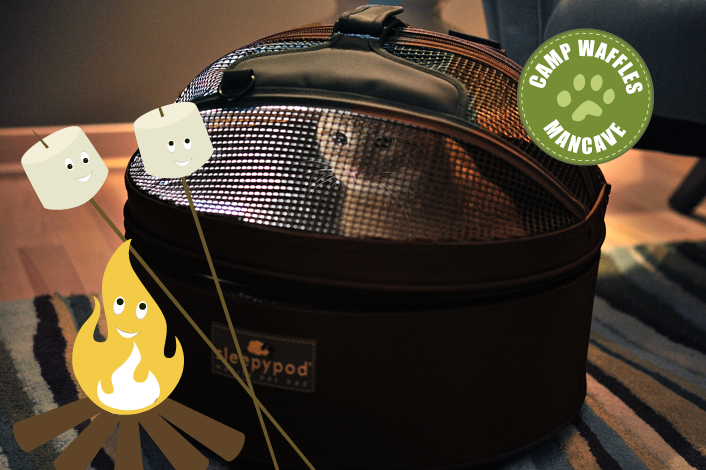 Waffles, if you joined Cat Scouts, you could roast marshmallows almost anytime you wanted at Campfire plus you could burn off some of your boundless amounts of energy. Purrs and paw-pats, Lily Olivia, Mauricio, Misty May, Giulietta, Fiona, Astrid, Lisbeth and Calista Jo. Whoa! W2, roasting marshmallows—or Mallomars—in the house is very dangerous so make sure you have a fire distinguisher handy. Thank you for the Gotcha Day wishes. Waffles, you're so silly. 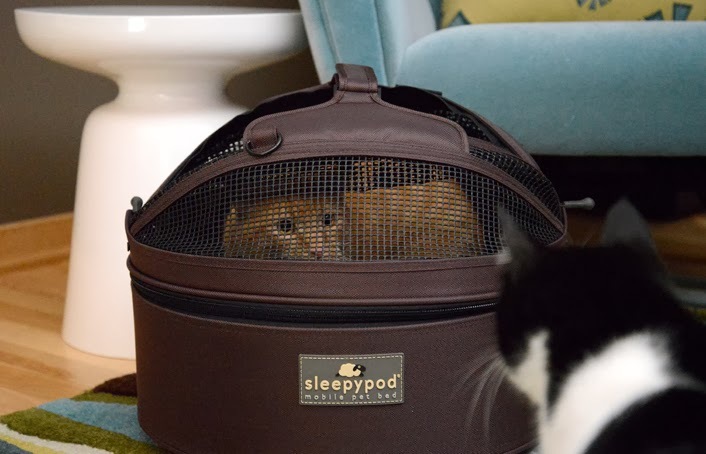 :D I love that you use the Sleepypod. If only they made a Sleepypod big enough for my dogs. Well, at least my dogs have the really safe seat belts made by Sleepypod for dogs. hehe! As long as your staying warm Waffles! I love your little man cave! poor Waffles, that Katie gives you a miserable time doesn't she? Will you make some s'mores for me please? Niles would love to join you in the sweet mancave! :) She'd be all about those marshmallows! i will take mine lightly toasted, thanks. - Crepes. This Kondo would be so nice to have for our cat Bernie, who has been fighting an infection for a long time and must be crated so that he's available for twice a day meds. This would be nice to put him in in the family room with us to reduce his boredom. I like Glogirly on Facebook. 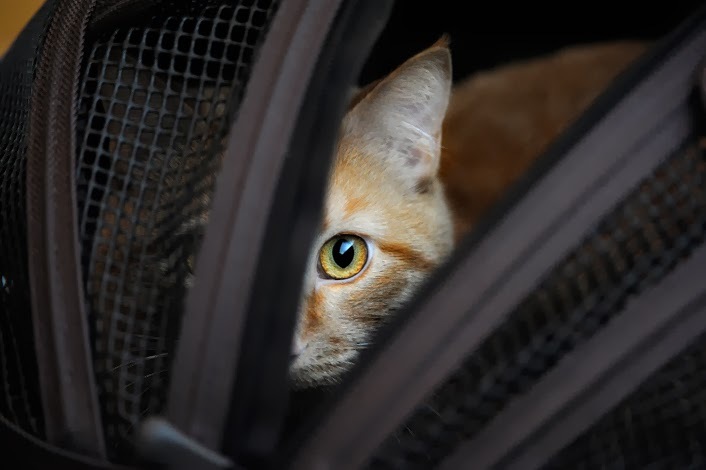 Hi Waffles..I am a new kitty here named Baby Tali..I will sits in there with yous ifs yous has some marshmallows! Maxwell: Waff, DOOD. Marshmallow! Marshmallow!! Waffles your eyes ... and in this case your "eye" is mesmerizing! And you love your sleepy pod!!! Ha, ha Waffles you are so silly. Waffles! Yous is just like Jo-Jo! You have a HEATED mancave?!?! I've got to get on this. I just have a fuzzy bed in mine. Waffles Wednesday: I'm King of the World! Waffles Wednesday: Happy New EAR?